The sizing is in the form of nR where n represents the shorter side of the photo and n is in inches. Eg, 4R size is 4 inches by 6 inches. For 10 inches and below, the longer side is 2 inches longer than the shorter side For 11 inches and above, the longer side is 3 inches longer than the shorter side. Here is the list of prices for our R photo sizes. If you are planning to print photos, below is a guide to the required resolution for your photos. Note: A1-A3 size is 200 pixels per inch and A4 size and smaller is 300 pixels per inch. 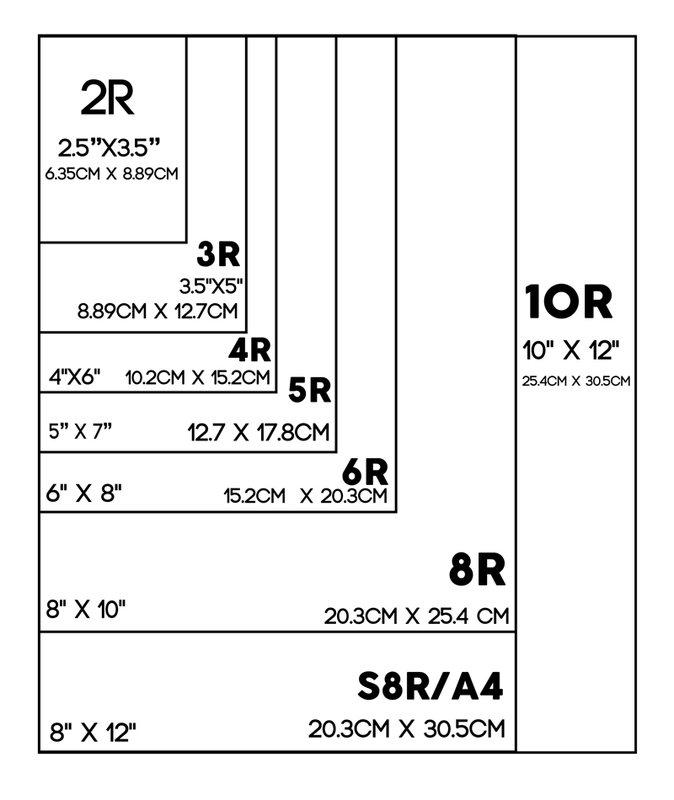 At Print For Fun, we also offer custom sizes if you have an odd-sized frame. Here is the link. If you have a standard Ikea frame, hop over to this page to upload your photos. Here is the list of prices for our larger format photo sizes. What is the size of a standard photo? The most common size for a photo is 4R, or 4 inches by 6 inches, typically because it's not too small and not too big. There are many types of frames available for that size. The aspect ratio of the photo print is 2 by 3, suitable for photos taken on majority of digital cameras and phone cameras. What is the image size of the photo? Image size usually refers to the pixel dimensions of the image, also known as the resolution of the image. It can usually be found when you right-click on the image and go to "Properties" on Windows or "Get Info" on Mac. You can also use our Photo Resolution Checker. What are the photo sizes in cm? 1 inch is 2.54 cm. Standard photographic sizes are in inches, but we have converted them into cm in our table above. What is a standard wallet size photo? A wallet size photo is about 2.5" x 3.5". That is the size of a 2R print. It's slightly bigger than a credit card.